I created this course so you can feel prepared with a holistic strategy heading into 2019. Imagine how it would feel if your brand reflected the full power and beauty of your sacred calling. What would shift for you if promoting your work felt like a sacred responsibility instead of a chore? Imagine how it would feel to know exactly what brand-building actions are priorities – to quit throwing pasta against the wall to see what sticks. How would your calendar and your time management be transformed? Imagine how it would feel to be LIT UP with confidence, passion, and clarity in the online space – to show up with joy and ease on social media. How would your self-esteem and your mindset be transformed? A well-loved, profitable brand begins with a holistic brand positioning strategy. Holistic refers to an approach to brand that takes all aspects of who you are into account: keeping your heart at the center of your brand-building endeavors. Because it’s not about the money – it’s about the change you’re creating in the world and the clients experiencing personal transformation through your work. Brand positioning refers to the process of communicating your brand identity to your Ideal Client. It’s about uncovering your Brand Soul and speaking from a space of deep personal truth. It’s how you draw your Ideal Client closer to your brand through your language, your attitude, and your values. Strategy refers to being intentional about how you build your brand by utilizing an actionable plan. It’s about learning how to leverage time-tested brand management truths in service of your Heart-Centered Legacy. It’s about how to invite more ease and less overwhelm into your business by attracting deeply fulfilling, profitable client relationships. It’s time to embody your own special brand mastery. ... Her work is thorough, embodied and articulate. My understanding of cultivating a truly aligned, impactful and resonant brand has given me the strength and the courage to stand fully present in my vocation and embody my own special mastery. If you are seeking the path toward expressing the fullness of your sacred work then it lies right here with Jade Consulting. Do not wait for another second to begin the journey with her! Every morning for 10 days, an email will be delivered to your inbox. Each day’s lesson includes a Summary, a Video, a Worksheet, and Additional Resources. At the conclusion of each 3-day Module, I will host a LIVE 90-minute video session and answer your questions personally so that you get the FULL VALUE of this experience. Flourish in the work you love by becoming a knowledgable practitioner of Brand Magick. You are strongly recommended to attend live sessions, but video recordings will be emailed to you following each session. My vision is a world where every woman thrives doing work she loves. To honor this vision, I gift a seat in this program every time it runs (6 times a year) to one special creatrix. What brand positioning is, why it matters, and how to leverage it – no matter what size your business is or how old it is. How to assess your brand in a big picture, aerial way that will reveal the most strategic place to invest your time and energy and set those priorities. How to coach yourself through key blocks and stretch into your personal power for a BIG branding up-level. How to activate your brand voice through Ideological Embodiment, visualization, and Archetypal Alignment. How to cultivate a resonant Brand Voice that catches your audience’s attention. Why some brands ignite a "HELL YES!" inside of you, while you pass by others easily. How to cultivate Brand Equity by contributing to the culture of your Ideal Client in meaningful ways. How to grow from the infant stage of Brand Awareness to the mature stage of Brand Resonance. How to reframe your understanding of brand as the way you show up online, not just the way you look online. The Jade perspective of brand-building as the alchemical partnership between the intuitive feminine and the strategic masculine. How to leverage Archetypal Alchemy to transform every aspect of your brand's identity in a way you never before thought possible. How to root into your daily mission for sustained vigor and increased focus, while always in view of your heart-centered legacy! How to discover your motivational pattern and step into your personal power. How to finesse the feel, impression, energy, and sensibility of your brand into a highly unique aesthetic and visual identity. How to craft a Brand Intention Statement to revolutionize your elevator pitch and manifest your Ideal Client. Will I have access to the content beyond 10 days? Definitely! Every aspect of this program is evergreen and will be accessible to you for a guaranteed minimum of 1 year beyond the date of your graduation. I will be upgrading the program into a learning platform in early 2019, and will give grandfathered students access to that new platform for improved ease of access. This program is the result of years of dedicated study, research, and 1:1 client work. I have codified my entire method of brand-building into one 10 day experience… it’s certainly a robust pace! I have had many students keep up at a perfect clip every day for 10 days. I’ve also found many students need extended time for integration and reflection. In order to honor everyone’s pace for this work, I have made this course evergreen. Additionally, I offer a 10 Week Brand Roadmap for those who generally need extended time for integration. What if I can’t make it to the group coaching sessions? Our group coaching sessions are designed to hold you accountable to moving through the entire program while also enhancing your experience! I do not come to these sessions with any agenda: I simply open the group for everyone to share what has been coming up for them, and then proceed to facilitate conversation and coach those who desire the extra guidance. In case you miss the live sessions, I do record these sessions on Zoom and make them available for the rest of the cohort! Please scroll below to see the dates & times of the sessions for our upcoming cohort beginning November 2nd. What if I already have a well-established business and brand? Do I need to completely redo everything I’ve already built? The work of brand is multi-layered and eternal. If you have a well-established brand already, you will enjoy going even deeper in this work and will really enjoy the live coaching sessions. We begin with Vocational Clarity and conclude with Archetypal Alignment: we cover every single aspect of crafting a holistic brand positioning strategy. Regardless of how long you’ve been in business, you will find an aspect of your brand’s positioning to bring into better alignment with your Vocational Essence and Brand Soul. What if I don’t have a brand yet at all? Is this course still relevant for me? Your brand, business, and sacred calling all operate in symbiotic relationship with one another: if you are clear about at least one of those aspects, this course is absolutely relevant for you! One of the most common themes I’ve found in my 1:1 brand coaching practice is that many of clients were developing websites, marketing plans, and launching ideas before doing the most fundamental aspect of building a business – positioning their brand. This is an expensive and stressful order of operations! Once you feel 100% clear about the substance and direction of your brand, you will know exactly how to build your business, what you should offer, and how you should craft it. What if I don’t have a business yet at all? Is this course still relevant for me? Brand is the prerequisite for building trust with your audience and, through that trust, actually selling your product or service. This has always been true, but it is more true in 2018 than it ever has been. The meaning of the work we do AND the actual work we do are completely inseparable from one another. If you don’t yet have a business, you are in the perfect place to invest in this 10 Day Brand Roadmap. You will enjoy far more success, ease, flow, and confidence in your business with brand foundations established. How do I know if this is the next right step for me? If you are looking for guidance on how to build your brand both offline and online, this course will be supremely relevant for you. I teach that brand encompasses both how we look online and how we show up online: There’s no one perfect answer to this question, so I encourage you to reach out to me directly to help you determine if the Roadmap is the next right step for you. Do you cover DIY design or a DIY brand identity in this course? While I believe that DIY design can certainly serve your business for an interim period of brand development, this course does not extensively address design-related brand concerns. This is because I teach that brand is first and foremost determined by how we show up online: not just how we look. However, we do touch on aesthetic with topics like color psychology, tonality, and curating culture. I believe that by equipping you with brand positioning foundations, you will be better prepared to partner with a graphic design professional to create your visual identity. Is this course practical, or is just about branding theory? 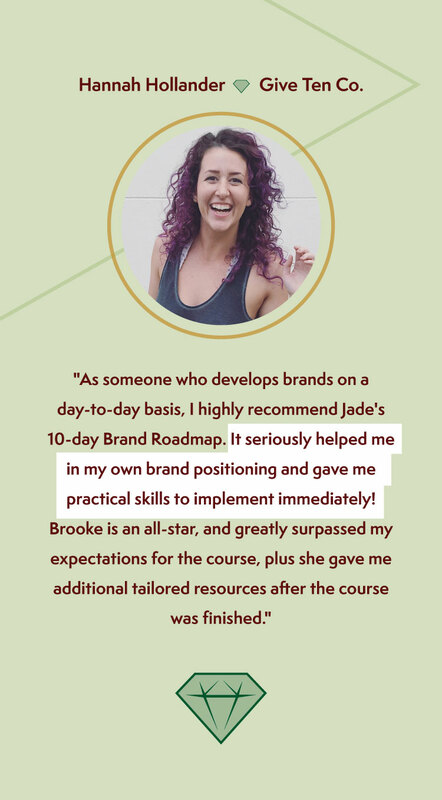 The 10 Day Brand Roadmap is a course in practical magick: I am presenting key brand strategy principles and guiding you in applying them to your business in actionable ways. This course is packed with plenty of inner work and outer work. It’s both profoundly educational and extremely actionable. If you are looking for a transformational experience with practical results, you will LOVE this program. Can I sample the material before committing to the program? Due to the intellectual property value of this work, I require payment upfront for you to view a sample. Enrollment Option 1 allows you to pay the balance of your tuition fee after first experiencing Day 1. If you would like to sign up for Enrollment Option 2 and would still like a sneak peek, please reach out to me directly. … purchased dozens of online programs, but haven't been able to create a clear plan of action? You've invested your precious cash in online programs, trusting in the flashy promise of yet another online business coach with a sales page that super-aggravates allll your pain points (don't worry, I have to) The program concludes without a phenomenal breakthrough, so you assume you weren't smart enough or clever enough or hardworking enough to "apply it like she did." I believe that in order for knowledge to be transformative, it must be integrative. I don't hold out on you in the 10 Day Brand Roadmap – I give you EVERYTHING I KNOW, and guide you through it in three 90 minute cohort coaching sessions to ensure you do, truly, GET IT. (Because you ARE smart, clever, and hardworking enough) I do ask that you give yourself unhurried, uncluttered, open-minded space to learn and integrate this knowledge. I want you to be able to graduate from this program with everything you need to cultivate a meaningful brand that magnetizes your Ideal Client. … felt deeply insecure about marketing your business and promoting yourself on social media? When you finally break down and agree to spend some time on social media, you feel like you're walking into a different universe that doesn't connect to your brand. The process feels stressful and time-consuming. Maybe you post content secretly hoping that no one will read it, or you keep all your writing tucked away on an old blog that has come to feel more like an intimate private journal than a resource for your people. … struggled to describe what you do in a compelling way that magnetizes your Ideal Client? You know the work you do is powerful. SUPER powerful. But you struggle to articulate it in a way that expresses its essence, impact, and import without becoming lengthy and technical. You feel like by the end of your post, you've lost your voice, and the piece rings flat. You might ask friends and family to read your content before posting it, endlessly performing tiny edits, because you aren't confident that your intent and emotion is really coming through. Your content can be better described as separate bits of information, different aspects of your work, that aren't unified into one cohesive narrative. You feel stuck in your head, forced to choose between writing from your heart and writing with the intent to sell. You want your Ideal Client to see themselves in the words you share, to interact with you, to believe in your work and see it's value. Wanna sample the Jade perspective before committing to the whole program? I support you fully! Take the Archetypal Alchemy Quiz for a juicy taste of this delicious work of Brand Magick. This quiz is handwritten by yours truly, and I’m constantly being told it’s “eerily spot on!” Email me and let me know which Archetype you received! Thank you for your interest in the 10 Day Brand Roadmap, my dear! You can expect a reply within 2 business days.